Malik in Arabic means the owner, moulk means power and sovereignty, whereas the English version of the Arabic phrase malik-al-mulk is: the LORD of SOVEREIGNTY. Allah executes everything in His Kingdom as it pleases Him; He is the LORD of SOVEREIGNTY. Milk, which means possession, could be used in a literal as well as in a figurative sense. Allah, Glory be to Him, says, “..they have neither the power to remove your troubles from you norto change them”(ISRAA’, 56). So in the previousverse, power is implied in a figurative way. Every kingdom on earth is ephemeral no matter for how long it lasts, and if the rule remains in someone’s grip, it will inevitably be conveyed to a successor; no matter how much he possesses, his possession is limited. A human being could be a king but not a possessor, for he cannot possess the hearts of his citizens nor the properties of others, and he may bea possessor but not a king, as he may possess properties and spacious lands but he cannot hold control over these lands or the people. Allah is the Possessor of the Kingdom, the LORD of SOVEREIGNTY, the King Who rules and establishes justice in His Kingdom; He possesses all things whether they are evident or hidden; first He originates everything from non-existence, second, He preserves them, and third, He managesand disposes His creatures’ affairs. Allah is the only King, all Supremacy is attributed to Him, in His Hand lies absolute power; He commands according to His Will andsettles everything; to Him all things return and there is none to keepback His Command, He is the absolute King, the Possessor of the Kingdom,the Sovereign. 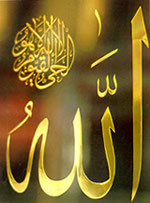 Praise and Glory be to Allah, the LORD of SOVEREIGNTY, He is Allah.